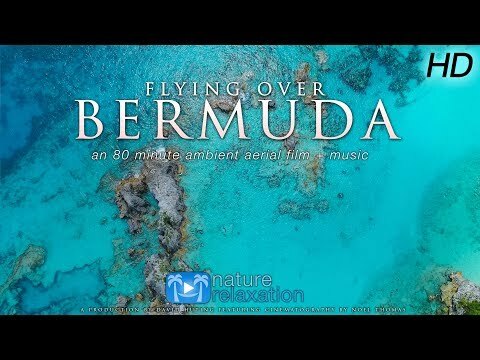 WATCH ON-DEMAND (No ads/watermark) @ https://watch.naturerelaxation.com/vi… | ABOUT: Relax and unwind as you soar above the vibrant turquoise-blue waters & coastlines of Bermuda for 80 minutes with «Flying Over Bermuda», the newest Nature Relaxation aerial film shot in 4K Ultra High Definition. Viewers will enjoy stunning high resolution aerial cinematography of Bermuda’s most beautiful and majestic sights, including Horseshoe Bay, Warwick Long Bay, Jobson’s Cove, Vixen shipwreck, Horseshoe Bay, Scaur, Ely’s Harbor, Daniel’s Head, Cavello Bay, Somerset, Cambridge Beaches, and other areas along the South Shore — filmed by new collaborator Noel Thomas («Majestic Flights»). Music by the Cynic Project, Frantz Amathy, Travis Revell, Adi Goldstein & Ocean Starfield. 4K Drone Video & Relaxing Guitar Music + Ocean Sounds: Caribbean Island Paradise Nature Relaxation™! Фильм "Моя Йога — 5".